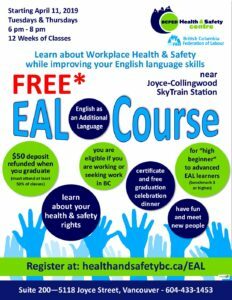 The goal of this 12-week program is to educate participants about workplace health and safety using an ESL curriculum model. Participants will have an opportunity to improve their language skills while learning about workers' rights in health and safety topics such as workplace violence, preventing back injuries, workplace chemicals (WHMIS) and identification of hazards. In this unique program, participants commit to attend a weekly, four-hour day session for 12 weeks. There is no charge to participants. Participants in these sessions will be able to use this knowledge and information to increase their awareness of health and safety and to become involved in OH&S committees at their workplaces. This EAL course is free. There is a fully refundable $50 deposit which will be returned to participants upon completion of 50% of the classes. In the past we have had many registrants who did not attend or were not able to complete the course. The deposit is to ensure participants are committed to completing the program. If payment of the deposit is a true barrier, please contact the Centre to discuss options. This new 8-week program is only open to participants who have previously completed one of our English as an Additional Language (or ESL) courses. The goal of this free program is to expand knowledge of some of the topics covered in Part 1, advance OH&S knowledge by looking at new topics and continue building English language skills. This EAL course is free. No deposit is required. Courses generally start in January, April and September. Check back here for start dates, or contact the Centre for more information. Private requests for organizations are possible. The BCFED Health & Safety Centre's ESL program was featured in Our Times Magazine.